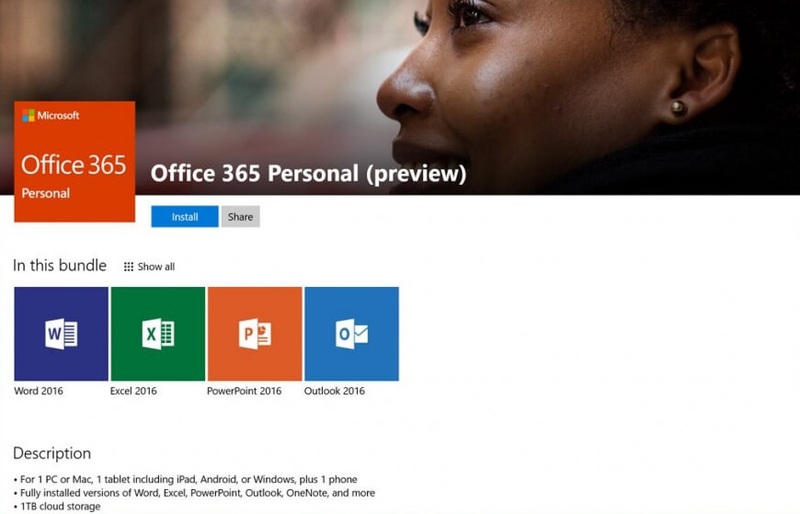 The full version of Microsoft Office has been released to Windows 10 S devices such as Surface Laptop (and other Windows 10 devices in the future) on Windows Store, eliminating the need for end users to manually download and install the Microsoft desktop apps. Open Start menu or screen, scroll through the App List and select an Office app such as Word, Excel, or PowerPoint. If Microsoft Office is not install yet, the Windows Store app will open. Surface Laptop running Windows 10 S comes with free 1 year of Office 365 Personal subscription during the preview period of Office in the Windows Store. Sign in to Windows Store with a Microsoft Account if you’re not already signed in. The Microsoft Account used in the Windows Store when installing Microsoft Office will be associated with Office, and the account will be use anytime you want to install or reinstall Office. Windows Store will open the Office app page. Click or tap on Install button. A notification appears in the lower-right corner after each app finishes installing. You can now start using Microsoft Office by selecting one of the app tiles, such as Word, Excel or PowerPoint on the Office product page. Office in the Windows Store is activated automatically on install. On the first run, an Office window opens telling you what apps are included in the version of Office you just installed. Hit Got it! to dismiss it.